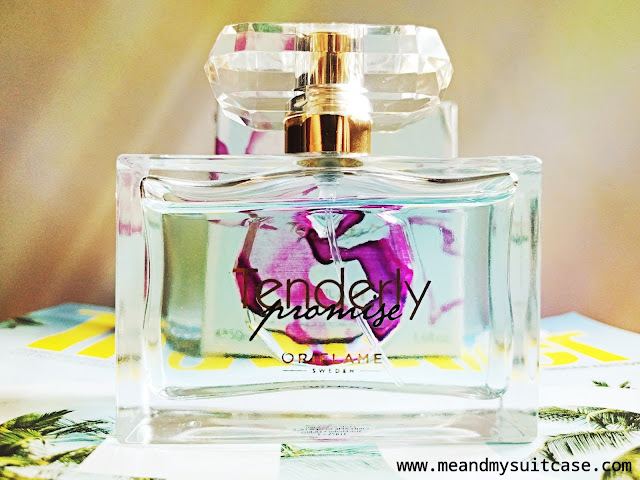 After using Paradise Deodorizing Body Spray by Oriflame for a long time I thought its time to try a Eau de Toilette. The time I set my eyes upon the Tenderly Promise Eau de Toilette, I couldn't take them off. The cute li'l bottle took my heart away. The product description was good enough for me to get it. As the site says, "This elegant fragrance bursts open with a joyful sparkle, while Royal White Lily slowly unfurls at the heart, radiating her glorious creamy scent, before settling into a soft, reassuring caress." I have been using it for past one month and its amazing. Very light and soft smell which lingers on for long. Just spray a little here and there on your clothes and you will feel fresh whole day. I don't know about lilies but its application makes me feel that I am wearing freshly laundered crisp clothes all day. Yes, it has that effect. 1. Feels fresh whole day. 2. It's a travel friendly bottle for its size and shape. 3. It's for the people who like soft and light smell, just spray a little on clothes near neck area, arms and bottoms near waist before going out and its fragrance would caress you for a long time. Not lily as claimed but feels and smells like freshly laundered clothes once applied.